The International Labour Organisation (ILO) will support Vietnam and the Vietnam General Confederation of Labour (VGCL) to fine-tune laws with ILO labour standards during the country’s engagement in the Trans-Pacific Partnership (TPP) agreement. Director of the ILO Office in Hanoi Chang Hee Lee made the statement at a working session with President of the VGCL Bui Van Cuong in Hanoi on May 19. He hailed the VGCL for its remarkable contributions to national construction and renovation, expressing his belief that the organisation will overcome difficulties to better ensure labour rights in the future. Cuong thanked the ILO and Chang Hee Lee himself for supporting Vietnamese trade unions. He said he hopes to receive more assistance from the ILO to better support workers as well as contribute more to global trade union movements. The VGCL is preparing a project to renew trade union activities, which appeals for constructive ideas from the ILO, he said. 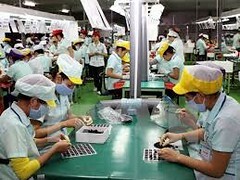 Vietnam became a member of the ILO in 1992 and has ratified 21 ILO conventions.